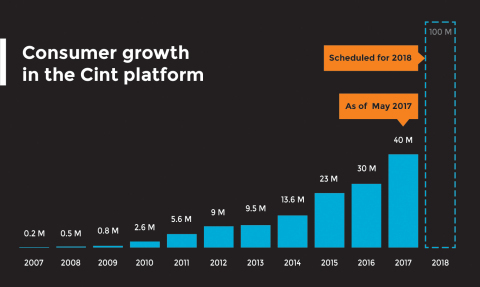 SAN FRANCISCO--(BUSINESS WIRE)--Cint, the world’s Insights Exchange, today announced the consumer base in its platform has reached 40 million globally, up from 19 million just six months ago. Cint’s supply partnership model targets publishers, brands and data partners, supported by proprietary panel management technology and a rich API subset. Cint’s core value to publishers is its ability to provide access to first party audience insights, and its compliance around data and privacy. Cint is a leading technology platform for marketers, researchers and consumer data players. The platform delivers the industry’s only global, verified audience to more than 1,000 customers and 1,500 supply partners, providing a user-friendly suite of self-serve interfaces. This Insights Exchange includes unique, registered, known and deeply profiled individuals that provide buyers and sellers of data with rich insights through a combination of self-declared, survey-based and observed or passively measured data. With Cint’s rapidly growing audience, the company will continue to build meaningful data-driven supply partnerships, maintaining its leadership in the market research sector. “Our technological advantage and experience in market research allows us to be confident that we can continue our recent growth, and are on track to surpass 100 million registered, unique consumers by the end of 2018,” Strand concluded. To learn more about its Insights Exchange technology and how a business can instantly access and benefit from insights from more than 30 million registered consumers, check out: www.cint.com. Cint is a software company developing technology to innovate the way insights are gathered. Cint specializes in API and SaaS solutions offering efficient, user-friendly tools to access online consumer panels, as well as panel management software. Cint’s exchange platform is a fully transparent insights marketplace, bringing together questions and answers from all around the world. Cint, the world’s Insights Exchange, today announced the consumer base in its platform has reached 40 million globally, up from 19 million just six months ago.